Thanks for stopping by. We’re glad you’re interested in helping Take Care of Texas! Hopefully you’ll find some fun and interesting ways to learn about the environment and how to help protect it. From the links below, you can play animated games, watch videos, explore interactive posters, and get ideas on ways to help out. 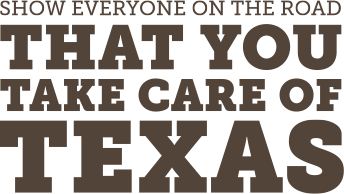 Don’t forget to tell us about the great things you and your family are doing to Take Care of Texas, and be sure to share our site with your friends. Doing your part is actually fun!